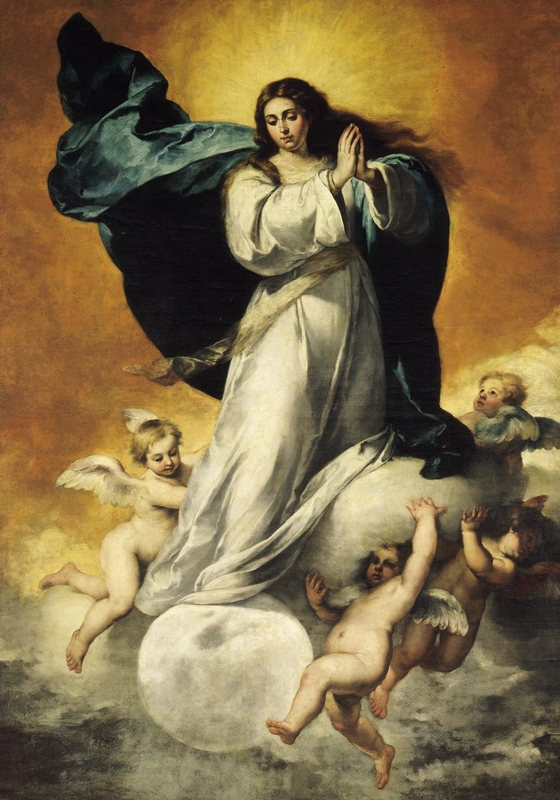 The feast of the Immaculate Conception of Mary states that it was not just John the Baptist, who prepared the way for the coming of the Messiah. The Virgin Mary, Immaculate since her conception, is the one who in the most high and generous way has straightened the path for the Lord. She did it by “crashing the serpent’s head” forcefully and definitively. When we feel that God’s ways are too difficult to follow and they look unattractive compared to the ones presented by the world as good, beautiful and desirable, let’s not forget that Mary is ready to come to us in the same way she went to Elisabeth. She gives us comfort and happiness to help straighten the winding ways of our hearts. Let’s learn from Mary to smooth out these ways so that we can proceed in good, with good and for the good. Our encounter with Christ is made possible because Mary brings Him to us in the same way as she took Him to her cousin Elisabeth. Let’s pray to the Madonna, who welcomed and guarded God’s Son under her heart so that we can welcome and guard in our heart Jesus, the everlasting love that became flesh. The grace of Mary and our fragile yes “transform the earth into an altar and the entire doing of the human race becomes oblation of praise (Lauds’ Hymn)” and of joy. If the Madonna had not agreed even God would have been sad. It is not an easy task to say our “yes” today as it was not easy then. Our assent is just the opposite of the so-called common sense. Two sins have been considered the most serious sins 2000 years ago in Nazareth and in the entire Jewish world. They are idolatry (=infidelity to God) and adultery (= infidelity to the husband). The Madonna in saying “yes’ to the angel “betrays” her husband and claims that hers is God’s son. Mary trustingly surrenders to God and God “surrenders” to her becoming flesh. The Virgin Mother accepted all from God became the Mother of Jesus and took the truth in her arms. This abandonment complete but not sentimental of Mary to the true God has allowed a true Christmas respectful of the goodwill of God. Let’s be prepared to say on Christmas day “Jesus is born” with less sentimentalism and a bigger understanding of the meaning of our “yes”. Mary has said: “I have trust in You, my God. You will defend and guide me”. Let’s do the same so that it can happen to us what has happened to Mary “The Word became flesh and lives among us”. 2. The Word indicated by a man, John the Baptist, and welcomed by another man, Joseph the legal father of Christ. The readings of the II Sunday of Advent time in the Roman Rite explain the meaning of Advent not as a simple waiting but as a joyful expectation for a long-awaited encounter that also involves a conversion. In the Scriptures, waiting entails joy. The believer doesn’t restrict himself to a passive and bored attitude but rejoices in the waiting of a loved one. The believer who loves can’t wait to meet the loved one. In the first reading, we learn about Jerusalem that sees her sons and daughters who had left in sorrow, return in joy. They are exultant “rejoicing that they are remembered by God for God is leading Israel in joy by the light of his glory”. In the second reading, Saint Paul from prison writes to the Philippians “I pray always with joy in my every prayer for all of you”. The psalmist in Psalm 125 ”The Lord has done great things for us: we are filled with joy”, is so filled of God’s joy that he makes it the central word in all the four verses of the psalm. In today’s gospel John the Baptist walks in the desert with such” an impatience” that it becomes an interior fire that levels the roads to salvation. All the readings are prompt by the joy of the faithful. This sentiment is summarized in the real encounter with God whose mercy gives us life (Readings’ hymn). Not only Mary the Immaculate and John the Baptist have leveled the roads for the coming of the Christ. Even Saint Joseph has made easier the divine mission of his wife Mary who gave birth to the second Adam, Jesus Christ our Lord. It is very important to remember that “No less than the woman who follows the path of marriage, the consecrated virgin is able to live and express spousal love: “in this kind of Love” she becomes, in the Church, a gift for God, for Christ, the Redeemer, for every brother and sister. Love the children of God. Your total and exclusive love for Christ does not deter you from loving all men and women, your brothers and sisters, because the horizons of your charity – precisely because you belong to the Lord- are Christ’s own horizons… Have a merciful heart and share in the sufferings of your brethren. Commit yourselves to the defense of life, to the advancement of women and to respect for their freedom and dignity. You know it: “You who are virgins for Christ” become “mothers in the spirit” (Ordo consecrationis virginum, n.16), by lovingly co-operating in the evangelization of man and in his advancement. (John Paul II “To participants in the International Conference “Ordo Virginum” on the 25th anniversary of the promulgation of the rite “June 2, 1995) . It might be odd that during Advent we have a reading that brings us deeply into the Passion of Christ. The reason is that it is important to remember that the Word of God enters the world not only with the humility of a child but grows up and must be welcomed with solemnity, joy, and seriousness when we grow up. ad te venio, coram te gemens, peccator, assisto. to thee do I come, before thee repentant do I knee . Four years later the truth of this declaration was confirmed by the Madonna at Lourdes during one of the apparitions to Bernadette “I am the Immaculate Conception”. Immaculate doesn’t mean preserved from the struggle. Even Mary had to fight the “serpent.”.= She knew the difficulty of “believing”, the growth in faith, the boredom of the daily life, the tearing pain then the loving embrace. “Immaculate” doesn’t mean without temptation. Eve was “immaculate” but she sinned. The “dogmas” that relate to Mary are related to us too. They are the “grammar” to understand humanity, to speak the language of every man and woman because her destiny is our destiny. AMBROSE; The Word came, and the voice followed. For the Word first works inward, then follows the office of the voice, as it is said, And he went into all the country about Jordan. ORIGEN; Jordan is the same as descending, for there descends from God a river of healing water. But what parts would John be traversing but the country lying about Jordan, that the penitent sinner might soon arrive at the flowing stream, humbling himself to receive the baptism of repentance. For it is added, preaching the baptism of repentance for the remission of sins. GREG. It is plain to every reader that John not only preached the baptism of repentance, but to some also he gave it, yet his own baptism he could not give for the remission of sins. CHRYS. For as the sacrifice had not yet been offered up, nor had the holy Spirit descended, how could remission of sins be given? What is it then that St. Luke means by the words, for the remission of sins, seeing the Jews were ignorant, and knew not the weight of their sins? Because this was the cause of their evils, in order that they might be convinced of their sins and seek a Redeemer, John came exhorting them to repentance, that being thereby made better and sorrowful for their sins, they might be ready to receive pardon. Rightly then after saying, that he came preaching the baptism of repentance, he adds, for the remission of sins. As if he should say, The reason by which he persuaded them to repent was, as, that thereby they would the more easily obtain despair. For the hill produces no fruit. ORIGEN; Or you may understand the mountains and hills to be the hostile powers, which have been overthrown by the coming of Christ. BASIL; But as the hills differ from mountains in respect of height, in other things are the same, so also the adverse powers agree indeed in purpose, but are distinguished from one another in the enormity of their offenses. GREG. Or, the valley when filled increases, but the mountains and hills when brought low decrease, because the Gentiles by faith in Christ receive fullness of grace, but the Jews by their sin of treachery have lost that wherein they boasted. For the humble receive a gift because the hearts of the proud they keep afar off. CHRYS. Or by these words he declares the difficulties of the law to be turned into the easiness of faith; as if he said, No more toils and labors await us, but grace and remission of sins make an easy way to salvation. GREG. NYSS. Or, He orders the valleys to be filled, the mountains and hills to be cast down, to show that the rule of virtue neither fails from want of good, nor transgresses from excess. GREG. But the crooked places are become straight, when the hearts of the wicked, perverted by a course of injustice, are directed to the rule of justice. But the rough ways are changed to smooth, when fierce and savage dispositions by the influence of Divine grace return to gentleness and meekness. CHRYS. He then adds the cause of these things, saying, And all flesh shall see, &c. showing that the virtue and knowledge of the Gospel shall be extended even to the end of the world, turning mankind from savage manners and perverse wills to meekness and gentleness. Not only Jewish converts but all mankind shall see the salvation of God. CYRIL; That is, of the Father, who sent His Son as our Savior. But the flesh is here taken for the whole man. GREG. Or else, All flesh, i.e. Every man can not see the salvation of God in Christ in this life. The Prophet therefore stretches his eye beyond to the last day of judgment, when all men both the elect and the reprobate shall equally see Him.